Steven (Chicagoland, United States) on 19 June 2017 in Plant & Nature and Portfolio. Photo captured May 27, 2017. Une très belle plante aux verts tendres ! Lovely light and great details here ! Une belle déclinaison de verts. Bravo ! 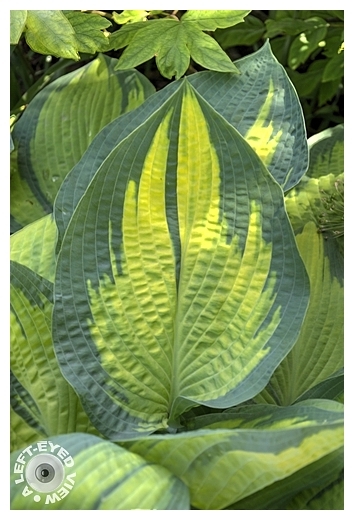 Very nice image of the Hosta. They really are a great plant to have in the garden. I like the light and the tones of green. Beautiful! Unusual tones and forms in this! I like the color and patterns in this leaf. Lovely patterns and colors. Very eye-catchibg. That's a peculiar leaf Steve! The shades of colors on it are quite something... Which plant is this? such beautiful frame, colors & pattern! Do you usually keep their flowers or cut them off? Do you also collect coleus or heuchera? Well, it's the same, I don't let them flower. In Malaysia, I used to grow a lot of caladiums! They were really showy and colourful. @London Caller: I definitely keep the flowers, but cut off their stems once the blooms are spent. You can see some of the blossoms with the tag hosta. A beautiful hosta leaf. We have had at least 2 weeks without rain and it has been really hot. The plants are feeling it even though I get out there and water. My hostas in the the front yard are all withered. It makes me sad. It's like a burning flame.